At our discretion, we authorize and pay overdrafts on checks, automatic bill payments, and other transactions made using your checking account number, such as ACH direct debits. In these cases, a fee will be charged. If you have elected to "Opt-In," we will also authorize and pay overdrafts on ATM and everyday debit card transactions at our discretion and a fee will be charged. If you have selected one of our overdraft alternatives (Overdraft Protection Transfer or Ready Cash Reserve), see our education topic “Overdraft Alternatives” for details. The maximum fee we will charge your account for overdrafts and returned items on any business day is $128.00. A $0.50 fee is charged for a denied ATM transaction at a machine we do not own unless your account is covered under the MoneyPass® Network of ATMs. We offer additional services to help you better manage your account: Online Banking and e.Statements, a mobile banking app for iPhone® and AndroidTM users, account alerts via push notification, email or text that will notify you when your balance reaches an amount determined by you, and educational resources on our website. Message and data rates charged by your mobile phone carrier may apply. We also offer overdraft alternatives, such as linking to a savings account (Overdraft Protection Transfer) or getting a line of credit (Ready Cash Reserve). For details, see our education topic “Overdraft Alternatives”. Checks and other transactions made using your checking account number such as ACH direct debits. 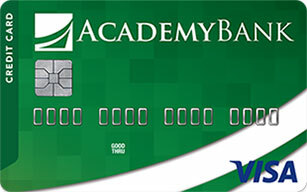 What if I want Academy Bank to authorize and pay overdrafts on my everyday debit card and ATM transactions? If you want us to authorize and pay overdrafts on everyday debit card and ATM transactions, log on to your account through Online Banking, click the "Overdraft Opt In" button, and follow the instructions. What if I never want Academy Bank to pay an overdraft. Can I opt out completely? You may instruct us to never pay any item that would overdraw your account. Opting out of all overdrafts may still result in returned item fees being assessed. To opt out of all overdrafts, contact any banking center, call (877) 712-2265, or email us at ODOptOut@academybank.com. It may lead to suspension of your account and may damage your credit. Any account receiving overdraft protection transfers will only be charged one transfer fee of $7.00 per day, regardless of the number of items causing the overdraft. If the balance in the linked account is not sufficient to cover the items, all available funds will be transferred, but the $7.00 fee will not be charged. Instead, you will be charged overdraft or returned items fees for any remaining items that cannot be covered by the transfer.